Here at RoomSketcher, our goal is to give you the tools you need to draft brilliant personal or professional designs that not only look good, but are also accurate. After all, what good is a floor plan if the dimensions more closely resemble a carnival fun house than an actual livable space? Yep, there’s no two ways about it: Drafting a floor plan in which every measurement is both precise and accurate is an absolute must. Fortunately, with RoomSketcher Home Designer, it’s easy to do. So to help you see how you can best utilize measurements on your projects, we’ve collected all our tips and tricks in one post—complete with tons of helpful videos to show you each process in action. At RoomSketcher, we have users all over the globe. And with different regions come different systems of measurements—most prominently metric vs. imperial (US) units. And if you’re one of our professional users with foreign clients, you may need to convert your design from one unit of measurement to another. So how do you convert from one system to the other? Watch this quick tutorial to find out! Notice that you can choose from different kinds of measuring tapes, allowing you to tailor the viewing experience to fit your needs. The outside measurements feature is only available to our VIP or Pro subscribers. If you’re not a VIP or Pro subscriber, no sweat! It’s easy to upgrade. 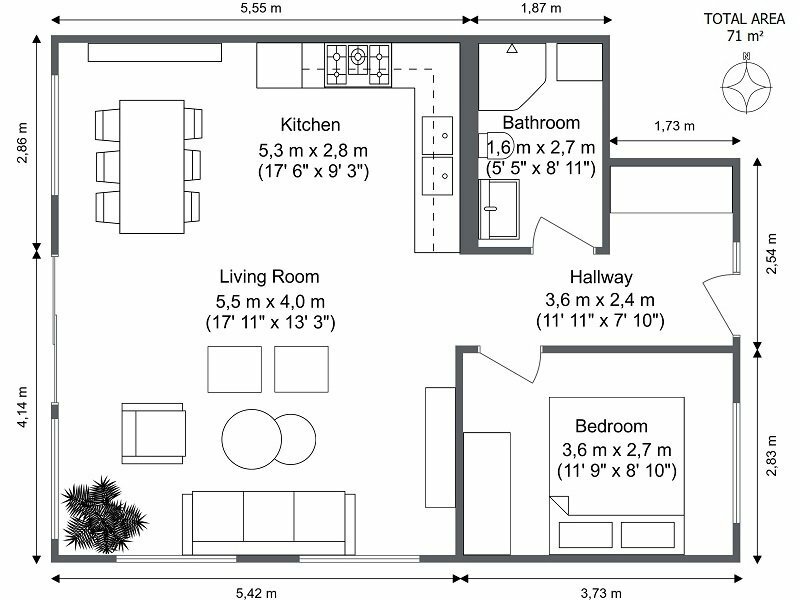 If you are a VIP or Pro, including inside measurements in your 2D Floor Plan is no sweat. Just make sure you have them enabled before creating your floor plan. Also, since we know you’re going to be sharing your designs with friends, family, clients, contractors, designers or prospects, we made it easy for you to include these measurements in your fully rendered 2D and 3D Floor Plans. We hope this helps you out with all your RoomSketcher measurement needs. However, if you have any additional questions about measurements, please reach out to us, and we will do our best to help you.